I'll just go ahead and say it. My kid is a picky eater! My oldest is three and his favourite foods include bagels with cream cheese, pickle and mustard sandwiches, and chicken fingers. Fine, but not that extensive a list. He'll also eat fruit of any kind and most vegetables, so I'm not worried about his health. What I am royally miffed about is my habit of making him something different from what mommy and daddy are having for dinner because his food repertoire is so limited. I don't expect him to get all psyched about curry for dinner, but c'mon! A little pasta now and then isn't gonna kill ya, kid! It's so frustrating and I know so many parents can relate. So, I'm on a mission to start cooking dinners more often that we'll all enjoy. Together. 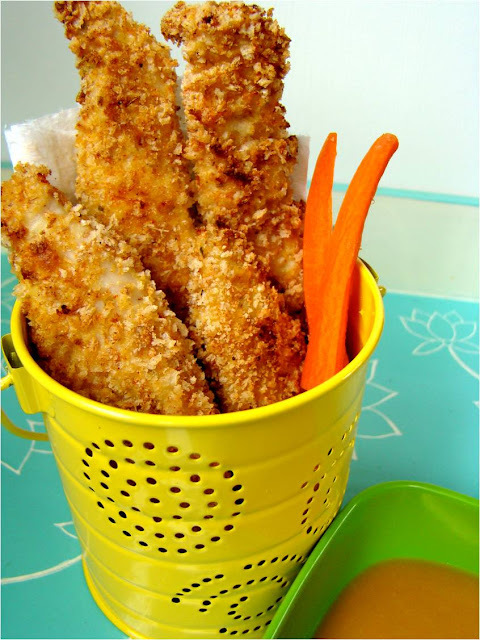 It's a no-brainer that chicken nuggets/strips/fingers are a hit with kids. They're crunchy, they're tasty, and dipping is just plain fun. 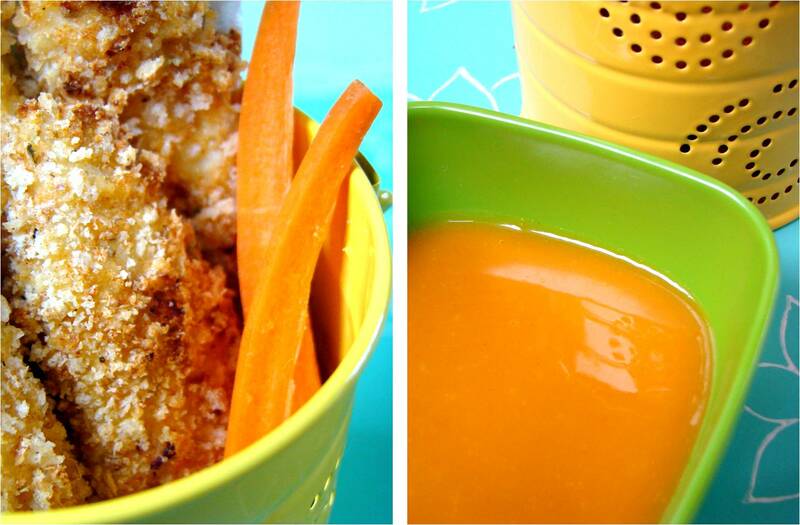 So this is where I'm starting on my mission of more shared meals - crunchy cluckers with a honey mustard dipping sauce. While the oven was preheating to 400 degrees (F), I mixed together the first seven ingredients in a medium bowl to make the crunchy coating. Then I got my assembly line set up for dredging, with the flour, beaten eggs, and the coating each in separate vessels. Each piece of chicken went first into the flour, then the egg, then the coating. At the end of my assembly line was a parchment lined baking sheet. Once all the pieces were coated, they went in the oven for 20 minutes and I flipped them half way through the cooking time. While the cluckers were baking, I made the honey mustard dipping sauce. 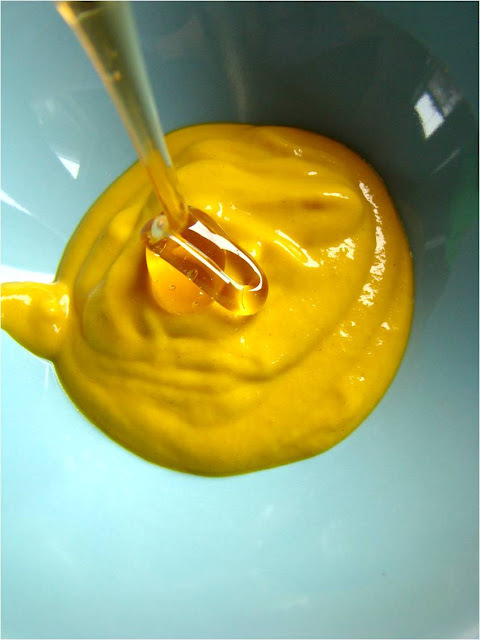 In a small bowl, I mixed the honey and the mustard. That's it. Honey mustard! Success! With some vegetables on the side, this is a meal we can eat in peace and togetherness. Days are too exhausting and relationships too important to spend dinnertime in a funk over picky eating. What do you do about picky eating? Is dinnertime stressful in your house too? What do you make that the whole family will eat together? Leave a comment and give me your tips, please! I read this at 8:45 and am trying to talk myself out of chicken fingers for breakfast. Yum!!! I'll be making those in the not so distant future. And I'm glad to hear my kid isn't the only one who won't eat pasta... I was beginning to think he was the only three year old that won't eat spaghetti or pizza!! Delish! You're a good mom! YUM!!! I need more of these recipes. Even the teenage 'childrens' turn their nose up at gourmet fare, and really what's the point if no one is eating your dinner? No point! Kids would love this! Oh no, Cupcake, don't tell me the teen years are gonna be just as bad! I'm just gonna cover my ears and pretend I didn't hear that. La la la. Thanks for all the cluckers love! 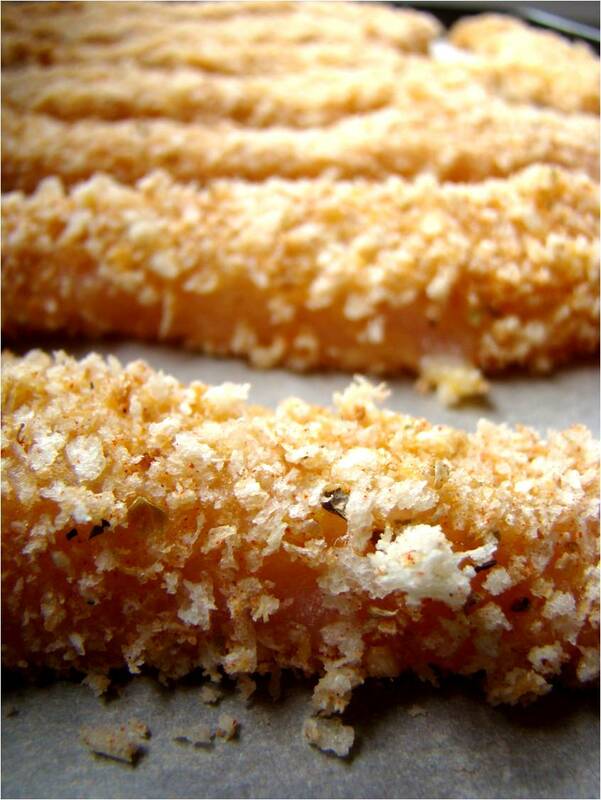 is the panko Japanese style or regular - wanna make these tonight! Hi Kirsten - Yup, Japanese style bread crumbs. I used the Kikkoman brand in this recipe. Let me know how they turn out! Hi! These are great. Can I freeze them? Good for school lunches! I have never tried freezing these but I've wondered the same. They get eaten too quickly around here! I would think that you could freeze them after they cool and then reheat them in the oven. Let me know how it goes if you give it a try! Making these for dinner tonight - for a second time. So easy and so tasty! !